The euro vs dollar continues to find some traction in the 1.43 price level following the sharp sell off in the euro during December, which was largely triggered by the failure to breach the 1.5150 price level and a coupled with a change in sentiment towards the US dollar based on the Non Farm Payroll figures. Indeed with this month’s data release just round the corner, the currency markets are waiting nervously for Friday’s release, with many whipsawing sideways and generally lacking any direction, which really sums up the euro vs dollar at present. 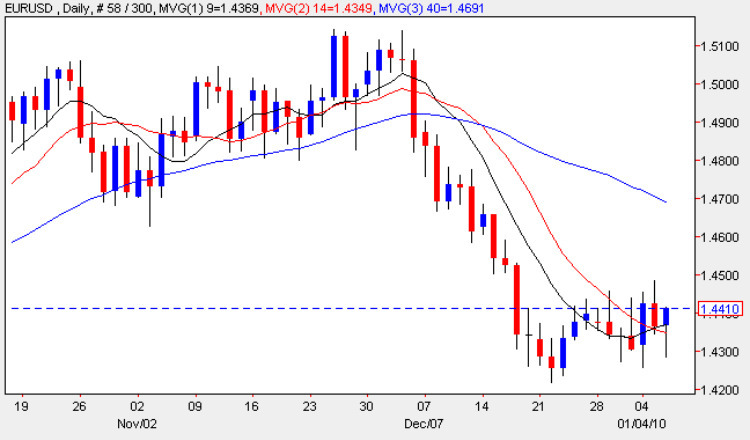 Technically the daily chart remains weak in the longer term, but in the short term the deep lower wicks of Monday and also today, suggests that there is a modicum of bullish sentiment towards the euro, and should we see a break and hold above the 1.45 price level, then this could develop into a minor rally and recovery for the euro vs dollar in due course. The 9 and 14 day moving averages would tend to support this analysis of the daily chart, with the 9 day having just crossed above the 14 day moving average giving us a bull cross signal, but with the depth of clear water above to the 40 day moving average, this is a very early technical signal at this stage. For any deeper move lower the congestion between the 1.38 and 1.43 level will define the depth of any price action, and any breach of the lower of these levels could signal a significant move possibly even as far as 1.25 in due course or even lower. Much of course depends on the US economy and the speed with which the FED move once a rate increase is signalled to the market, which of course brings us neatly back to Friday, which will provide an early indication of any future changes in rates which will no doubt see the US dollar strengthen as it recovers from its current position as the low yield currency for carry traders and speculators.